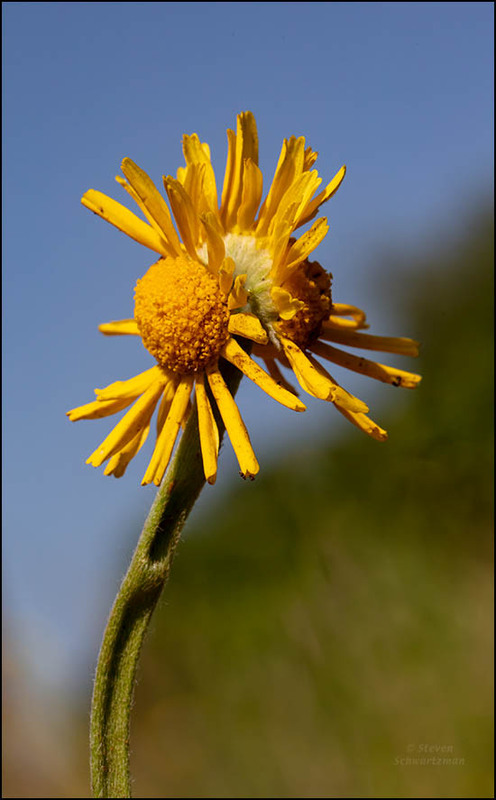 On April 12th, when I came back along the same path west of Morado Circle that I would end up spending almost three hours on, something caught my attention that I’d walked right past on the outbound stretch: a four-nerve daisy (Tetraneuris spp.) that didn’t look right. When I bent down to check it out, I saw that it was fasciated. 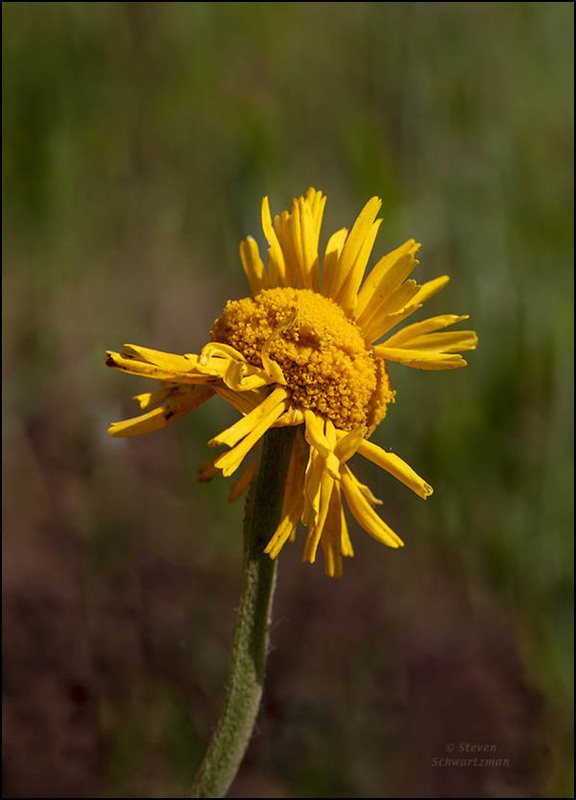 The stem was flattened and partly concave, and two flower heads were glommed together. 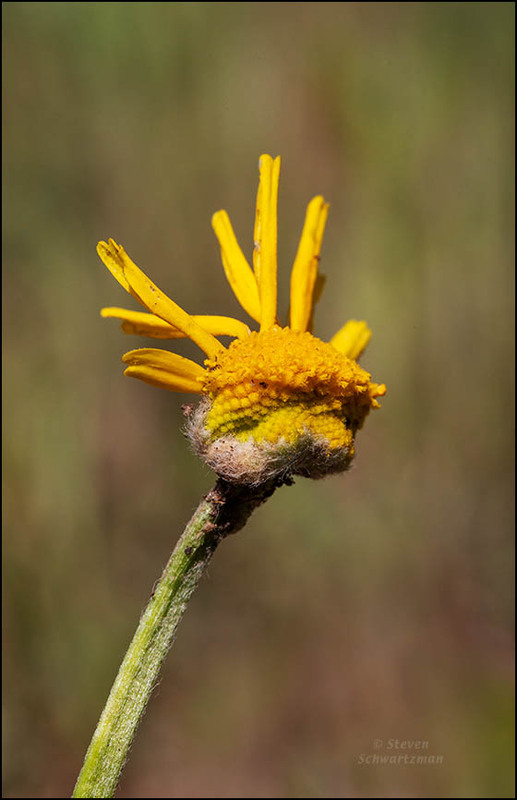 After taking a bunch of pictures from various angles, I noticed another fasciated four-nerve daisy close by (see below). The unusual features in these photos are typical of fasciation. To see other such plants that have appeared here, you can click the “fasciation” tag at the end and scroll through a dozen relevant posts. 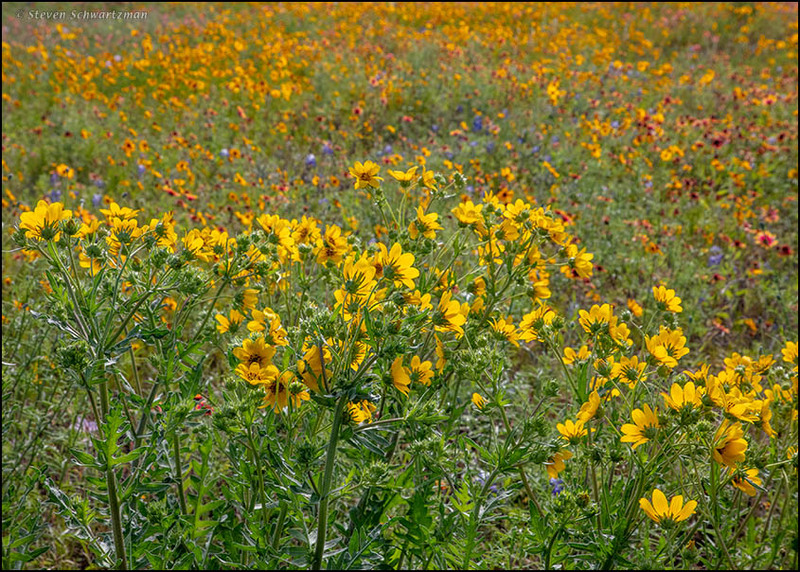 Various posts here have made clear that by far the densest and most widespread wildflower displays I saw this season grew in an east-west swathe below San Antonio in March. 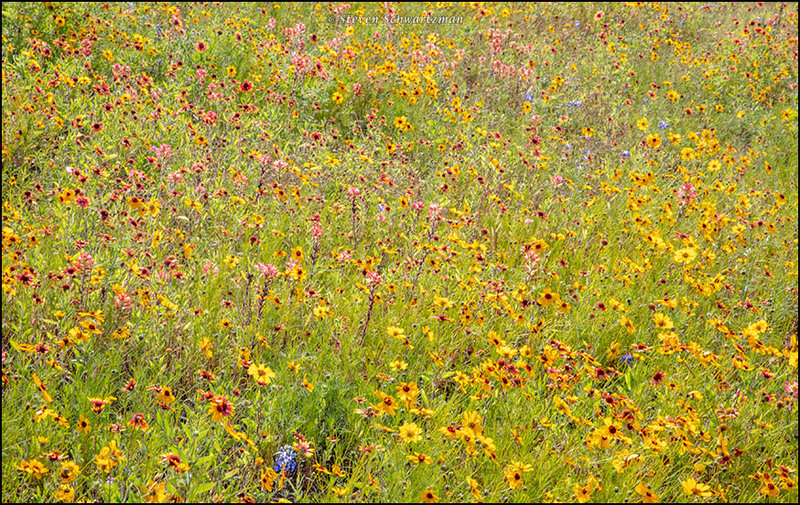 As spring advanced northward, Austin got a few respectable displays too, even if not nearly so expansive. 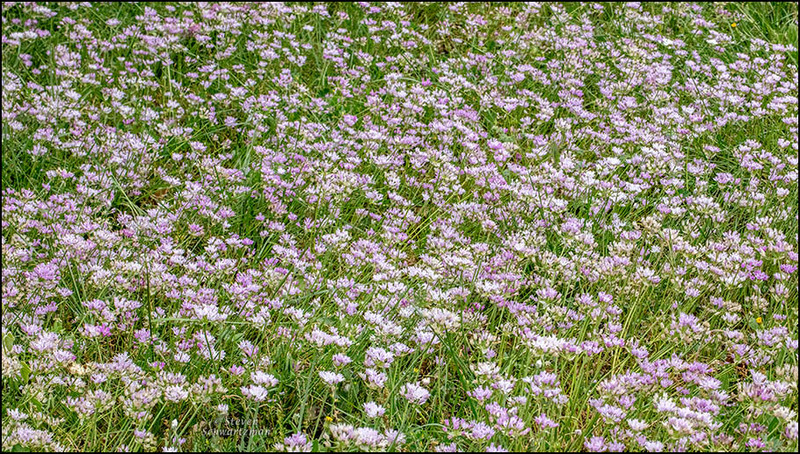 Above from April 8th in the northeast quadrant of Loop 360 and RM 2222 is one such wildflower display with greenthread (Thelesperma filifolium) as the predominant species. Below from the same place you’ll find some fresh Engelmann daisies (Engelmannia peristenia) in the foreground and various other wildflowers behind them. On April 12th I wandered for close to three hours along the right-of-way beneath the power lines west of Morado Circle. It was spring and a lot was happening there. At one point I noticed a robber fly on a rock on the ground. I moved in slowly with my macro lens, hoping the insect would stay put. It did, and I took a bunch of pictures from several angles. The robber fly seemed unusually docile for one of its kind, and I suddenly wondered whether I could lift up the rock and take pictures that would have a less distracting background. 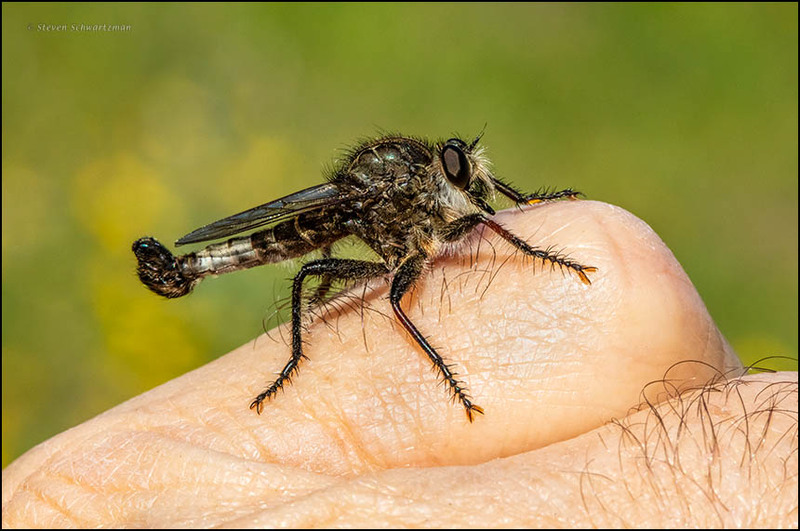 Slowly I put my left thumb and index finger around the rock to take hold of it, gradually stood up, and was relieved that the robber fly stayed on for the ride. After I held the rock out in front of me and was about to try for a few more pictures, the fly moved around a little, then walked off the rock and onto my hand. 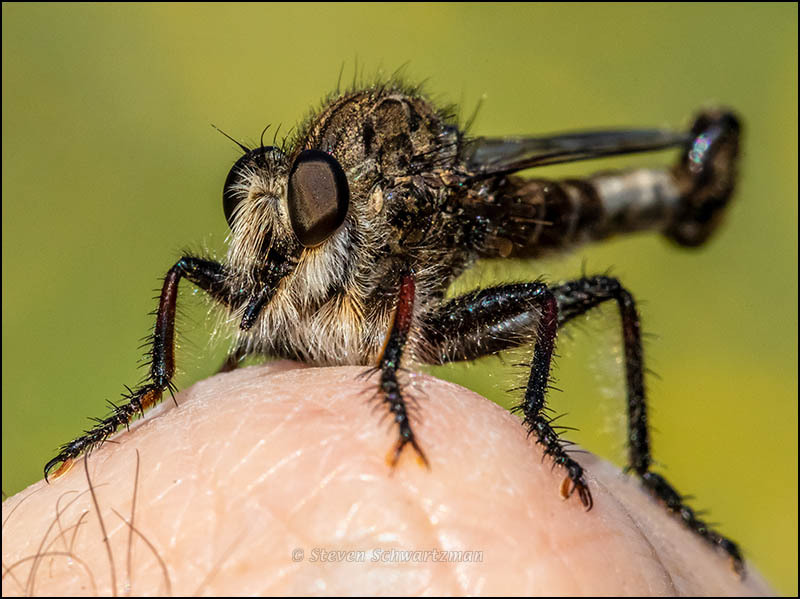 Robber flies are fiercely carnivorous, “robbing” other insects by pouncing on and devouring them, so I wondered whether this handy visitor might suddenly take a nip out of my skin. But no, the robber fly remained friendly, as polite a digital guest as any nature photographer could want. For a classic three-quarter view of the subject with a better look at its characteristic “moustache,” click below. If you’re interested in photography as a craft, the newly added point 30 in About My Techniques applies to these two portraits. 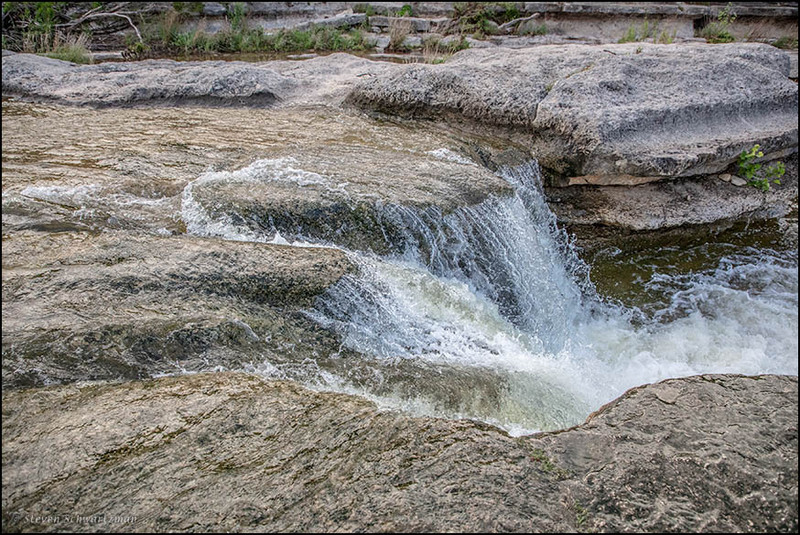 On April 8th, after photographing Bull Creek’s wide falls, I moved half a mile downstream and dealt with a waterfall that’s narrower and not as tall but that was still forceful after the weekend’s rain. 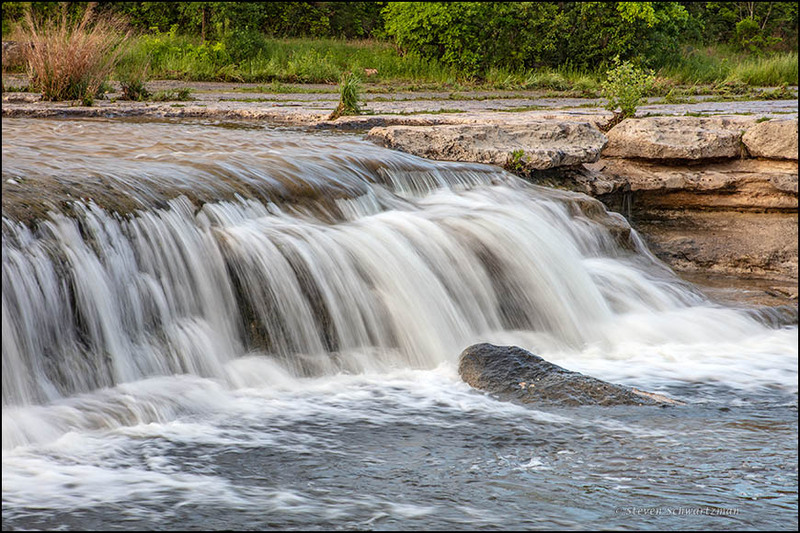 Where I showed you pictures of the other falls at cotton-inducing speeds of 1/10th and 1/8th of a second, this time you’re getting the stop-action look of 1/1250th and 1/1600th of a second. 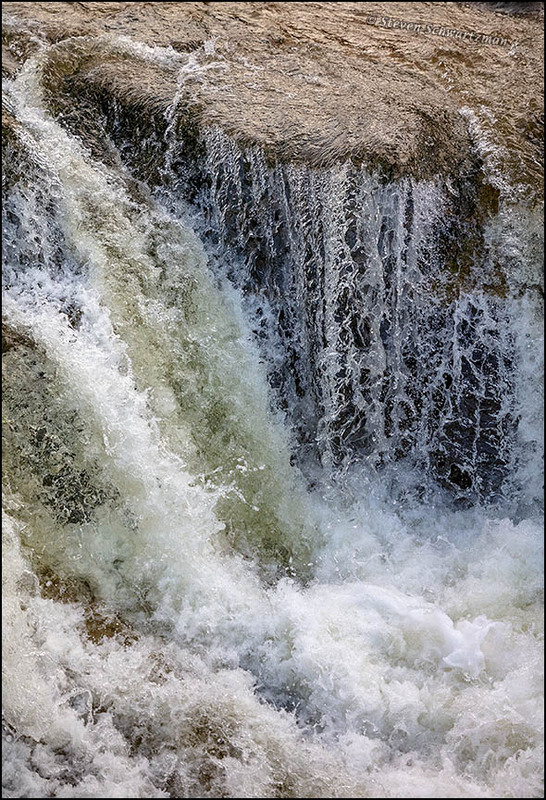 The second photograph, taken from farther to the right but zoomed in more, gives you a closer view of the falling and churning water. And speaking of falling, the wet rocks were pretty slippery, so prudent me didn’t risk getting any closer to the edge, even for the sake of what might have been a better picture. 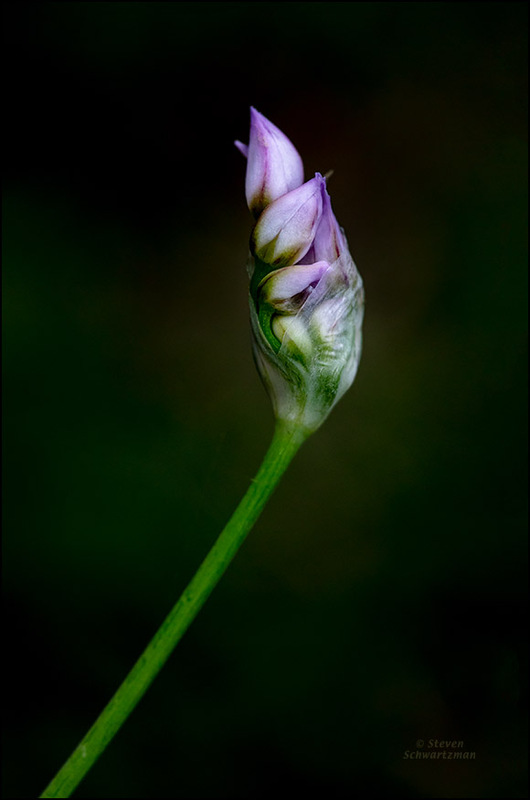 Above is a little packet of wild garlic buds (Allium drummondii) on Floral Park Dr. in my neighborhood on March 30. 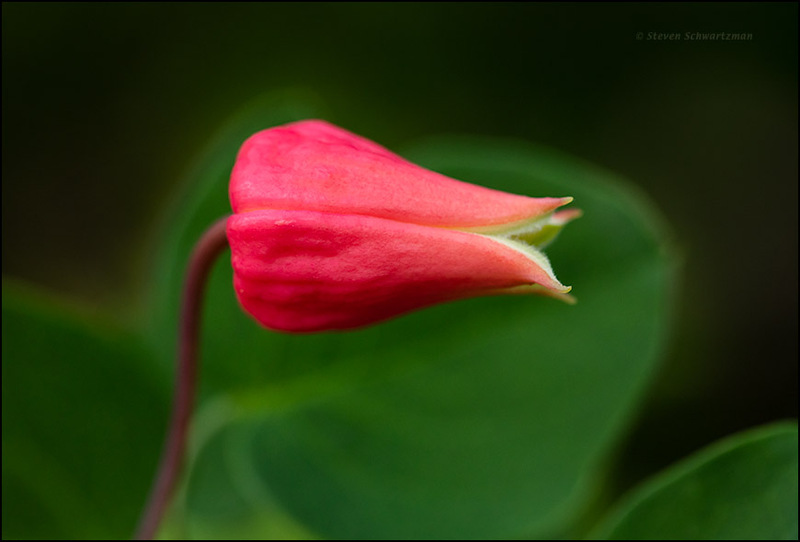 The second picture, taken during the same photo session, shows how buds give way to flowers. 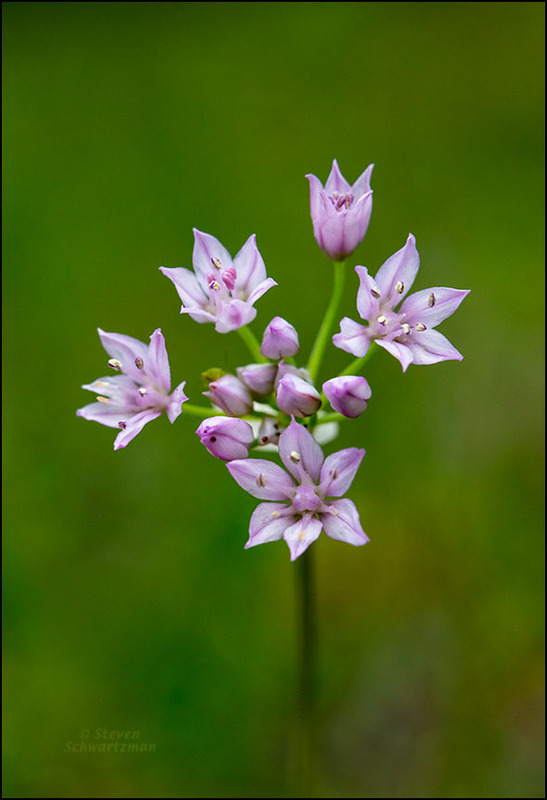 And below from April 1st along Balcones Woods Drive is a colony of wild garlic flowers that had fully opened. 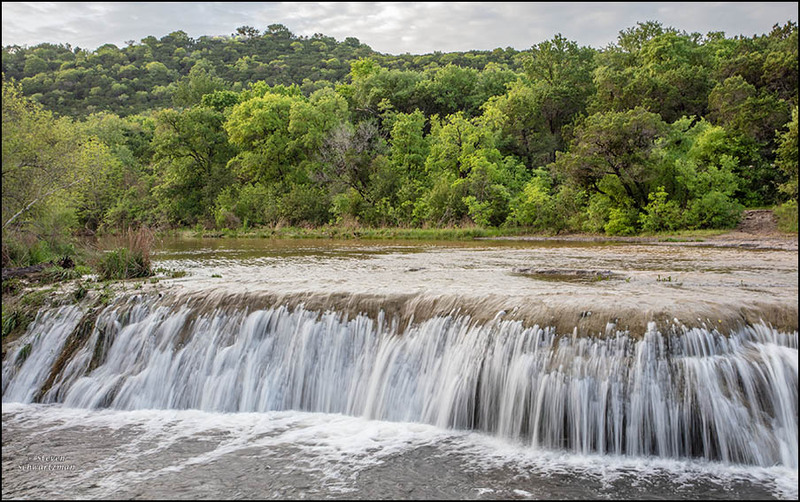 We had rain on Saturday and Sunday, so Monday morning I went over to Bull Creek to check out its wiiiiiiiide waterfall. No one had moved it, as these two pictures confirm. Notice the switchgrass in the upper left of the second photo.